It's Great to Be a Miami Hurricane! - Sánchez-Roig Law, P.A. Sánchez-Roig Law, P.A. brings together the expertise of a former federal prosecutor and former immigration judge with over 40 years of combined experience. The firm prides itself on intimate knowledge of the complex immigration system cultivated by decades of service. It’s Great to Be a Miami Hurricane! 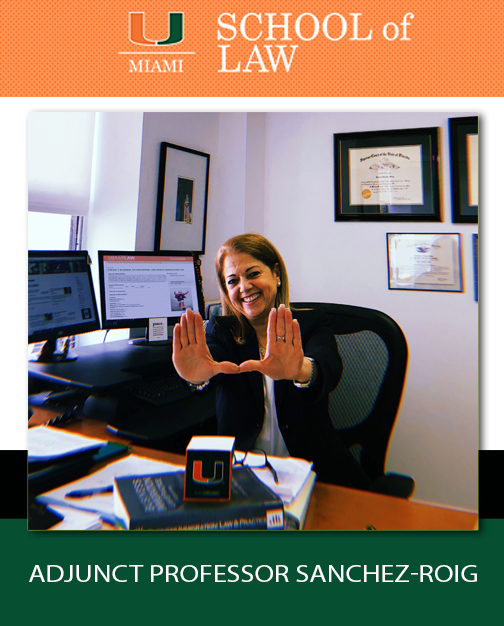 Attorney Sanchez-Roig is looking forward to teaching Business, Entertainment, and Sports Immigration Law at the University of Miami School of Law, this coming Fall. Our e-mail newsletter will keep you up to date on immigration issues, federal government policies and procedure, changes in state law that may impact your case, or news regarding our firm. © 2019, Sánchez-Roig Law, P.A.